Synaptics Incorporated SYNA recently announced that it has entered into a collaboration to develop a platform that will aid television service providers in offering improved Pay TV services. The collaboration involves “VS-550 (UHD) and VS-420 (FHD) multimedia processor SoCs running iWedia’s set-top-box (STB) software stack” and STB hardware from Tonly, a prominent consumer electronics original design manufacturer (ODM). The partnership is expected to meet the rising needs of the Android TV market. Notably, per a recent report by IHS Markit, the market share of Smart TV is expected to reach 70% in 2018 from less than 50% in 2015. Moreover, 40% of the smart TVs will have Android operating system (OS). In such a scenario, the collaboration is expected to help Synaptics benefit from Android TV market growth. The solutions that can be deployed via the platform include “key pre-certifications and quality assurance (QA)” as well as a number of product maintenance related services. This will also ease the process of “over-the-air (OTA) upgrades”, thereby reducing operating expenses and increasing revenues of service providers. This platform is anticipated to witness significant demand once available in the market. This, in turn, is expected to boost the company’s financials and share price going forward. 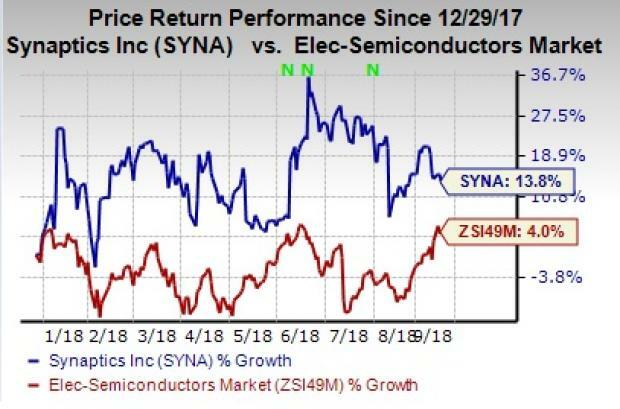 Shares of Synaptics have gained 13.8% year to date, significantly outperforming the industry’s 4% rally. The company is expanding in the television market rapidly. It recently announced that TCL Corporation has adopted its AudioSmart far-field voice (FFV) technology for television sets that have Alexa, the smart speaker from Amazon AMZN, built in. Notably, TCL adds to the prominent clientele of Synaptics’ AudioSmart far-field voice DSP technology. The technology has already been adopted by Baidu BIDU for its Duer Mobile Accessory platform as well as by Samsung for its digital assistant Bixby. Notably, the company expects the weakness in the smartphone market, the majority revenue contributor, to continue in the second half of the calendar year. This might hurt its financials. However, the company’s solid partnerships with the likes of Microsoft MSFT and Advanced Micro Devices bode well. Additionally, a surge in demand for smart homes, smart devices as well as voice-enabled products is aiding Synaptics’ Consumer IoT products segment. Revenues from this segment increased 319% on a year-over-year basis in fourth-quarter fiscal 2018. We expect this to aid the Zacks Rank #3 (Hold) stock’s performance going ahead.